President Recep Tayyip Erdoğan (L) speaks with Russian President Vladimir Putin during their meeting at the Kremlin in Moscow, April 8, 2019. Turkey and Moscow are looking to boost cooperation in Syria to ensure the country's territorial integrity, fight terrorist groups and establish a constitutional committee as part of the political solution. "Syria's territorial integrity is critical and in order to provide that Turkish-Russian cooperation is a must," President Recep Tayyip Erdoğan said yesterday during a joint press conference with his Russian counterpart Vladimir Putin. He underlined that "our main aim is to protect Syria's territorial integrity." Putin also emphasized the importance of the cooperation between the two countries, as preventing Syria from any kind of division is critical. Ahead of his departure from Istanbul for Moscow, Erdoğan also told reporters that Turkey's cooperation with Russia continues to increase and becomes stronger each day. "Idlib is a very important region. If people leave Idlib, they would come to Turkey. Therefore, it is a sensitive region for us. Both Russia and we are making our best efforts against terrorist organizations," Erdoğan further said regarding the efforts of the two countries in Idlib, particularly the establishment of a de-escalation zone. "We've taken various necessary steps so far and we will continue to do so," he added, underlining that it is not quite easy to achieve improvements in the region due to the presence of terrorist organizations. There are currently 3,644,342 Syrian refugees living in Turkey. The refugee flow to Turkey started at the beginning of the Syrian crisis in 2011. So far, Turkey has spent some $30 billion for the needs of refugees living in tent camps as well as those living outside the camps on their own. Putin also expressed that although the desired level of security in the region is yet to be reached, there has been remarkable progress so far thanks to cooperation between Turkey and Russia. "So far, 300.000 people returned to their homes and if we can be more determined, the number may rise even further," Erdoğan said, referring to the improvements in the northern Syria that are achieved following Turkish military operations. "Only a few months ago, everyone was trying to flee Idlib but now they want to return, but this is not enough for us. Idlib can also be like Jarabulus or Afrin, where life has returned to normal. However, in order to reach that, terrorism must be cleared from the region," he emphasized. Some 311,968 Syrian refugees have returned home thanks to the peaceful environment provided by Operation Olive Branch and Operation Euphrates Shield. 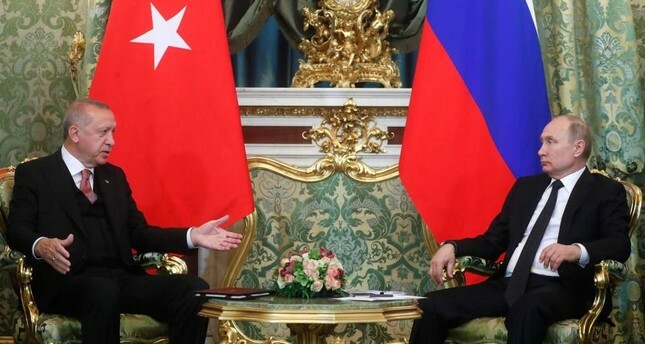 Erdoğan and Putin agreed in September 2018, following their talks in Sochi, to establish a demilitarized zone in Idlib in order to decrease tension and prevent a new conflict in the province. The deal was internationally praised as it prevented a looming humanitarian disaster that would have resulted from a regime offensive. In line with the Sochi agreement, opposition forces withdrew their heavy weapons on Oct. 10, 2018. Recalling Turkey's firm stance one the YPG terrorist organization, Erdoğan said that the country's struggle against the group will continue. Ahead of the press conference, Erdoğan underscored that he will also discuss Ankara's imminent operation east of the Euphrates against the PKK's Syrian affiliate, the People's Protection Units (YPG). "We might come suddenly one night to the place where we need to," he reiterated. The YPG functions under the Syrian Democratic Forces (SDF), which is heavily backed by Washington under the pretext of fighting Daesh. Turkey sees no difference between the PKK, a group also listed on U.S. and EU terror lists and claimed the lives of more than 40,000 people in a 30-year terror campaign, and the YPG in Syria, as the two groups are organically linked and have fluid movement of members between their lines. Currently, the YPG controls approximately 25 percent of Syrian territory and nearly 65 percent of the 900-kilometer border with Turkey. In the wake of the YPG threat near its borders, Erdoğan and many other Turkish officials vowed to launch an operation east of the Euphrates, which is under the YPG's de facto control, "very soon." Following U.S. President Donald Trump's announcement of the withdrawal, the long-awaited operation was put on hold until U.S. troops leave the region. However, Turkey has been mobilizing its troops to be ready for every possibility. In the past two years, Turkey launched two cross-border military campaigns to completely remove Daesh from Turkey's southern border and prevent YPG militia from unifying its cantons while providing a terrorist-free zone in Syria for refugees to return to their hometowns. In relation to the issue, Presidential Communications Director Fahrettin Altun emphasized that both countries will respect the territorial integrity of Syria and the fight against terrorism in their cooperation. Moscow has been Ankara's partner in Syria for some time now due to common understandings in Syria. In addition to the initiation of Astana talks by Russia, Turkey and Iran, as a part of efforts to find a permanent, political solution to the seven-year-long civil war in Syria, numerous Russian officials, including Russian Foreign Minister Sergey Lavrov, expressed support for Turkey in the fight against the terrorist organization and condemned Washington for seeking to establish a quasi-state, regarding the U.S.' activities in Syria unacceptable. Turkey's NATO ally, on the other hand, while listing the PKK as a terrorist group, opted to continue its military support for the terrorist organization by providing truckloads of military supplies and military training, putting its bilateral relations with Ankara at risk.Lavrov also underscored on Sunday that there is no alternative to the political situation in Syria in line with Resolution No. 2254 of the U.N. Security Council. Lavrov also highlighted that the work to establish the Syrian Constitutional Committee is nearing an end, adding that the committee will begin their activities in Geneva in the near future. The first meeting of the Astana process was held in Turkey in January 2017 with an aim to bring all warring parties in the Syrian conflict to the table to facilitate U.N.-sponsored peace talks in Geneva. The Astana talks have been aiming to establish an U.N.-backed constitutional committee in Syria as part of finding a political solution. The planned constitutional committee will be tasked with carving out Syria's post-war constitution, which is seen as a stepping stone to elections in the war-torn country.